It’s time to stop throwing fruit and vegetable scraps in the garbage. 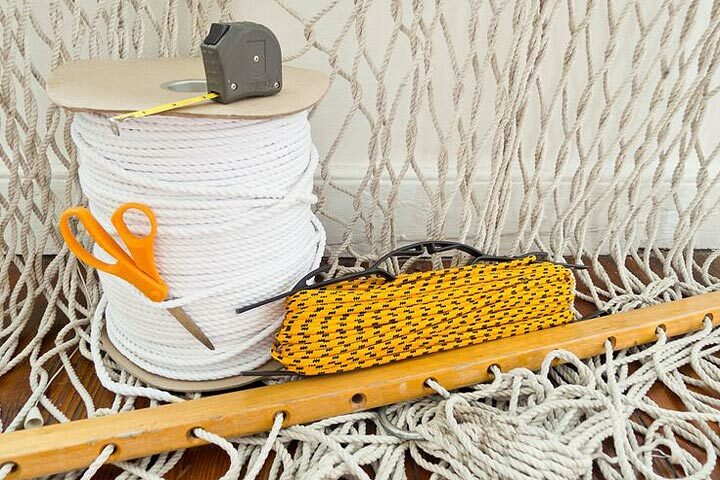 Use them instead to re-grow the plants for a second (and free) harvest! There are many plants that will re-grow their edible parts with just a little encouragement and the right environment. Read on to find out which plants you can re-grow plants from grocery store scraps! You aren’t throwing your lettuce ends in the garbage can, are you? 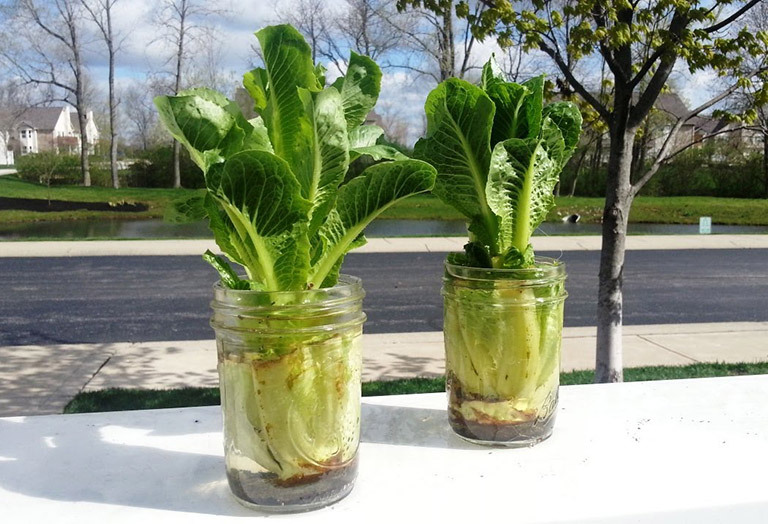 You can re-grow a crop of romaine lettuce by placing the butts in a cup of water. After a few days, new lettuce leaves will emerge and you can cut and eat all over again. If you plant the lettuce butts in soil, you’ll get a stronger second crop than if you grow them in water. 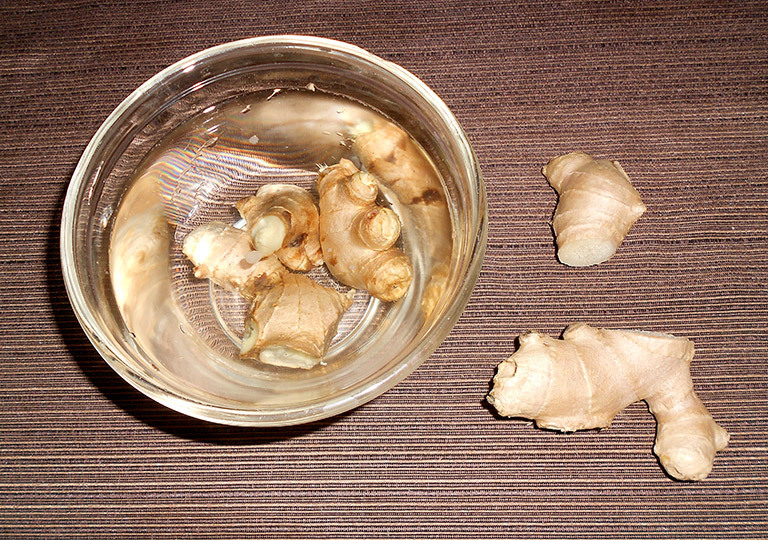 You can use a small piece of fresh ginger to grow a whole new crop, and it will even enjoy growing in a pot indoors. 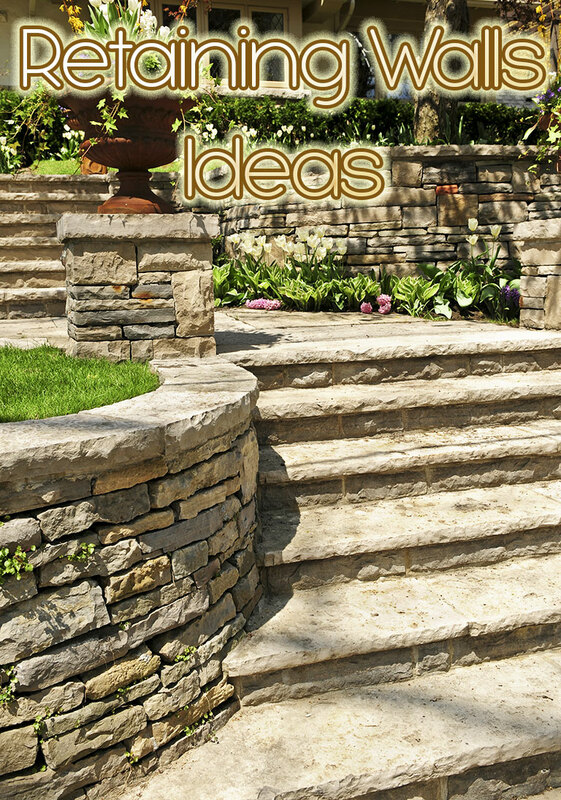 Make sure the piece you’re planting has at least one eye on it, and try to position the eye upward. Ginger likes to grow in partial shade so it will do well on a windowsill or shelf near a window. This one is a bit tricky, and will take several years to produce a fruit. You can re-grow a pineapple plant from the greens of a pineapple, which you would normally throw away. 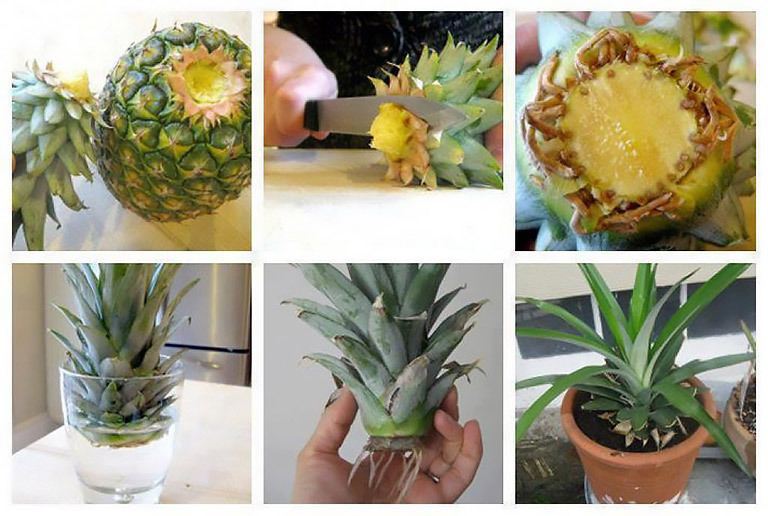 To do this, cut off the top of a pineapple, strip off the lower leaves and cut off any remaining fruit. Leave it to dry for a week, then place the bottom in a cup of water. Change the water every few days and wait until you start seeing roots emerging from the bottom. When your pineapple has rooted, plant it in a pot with rich potting soil and care for it the same as your houseplants. After a few years your new houseplant will produce a brand new pineapple. Cutting off the root end of an onion and planting it in the garden, root-side down, will produce a whole new crop. This project may be more fun for kids or experimentation than it would be for actual crop production, as you’d probably be better off buying onion sets to plant in spring to grow a decent amount of these crops. 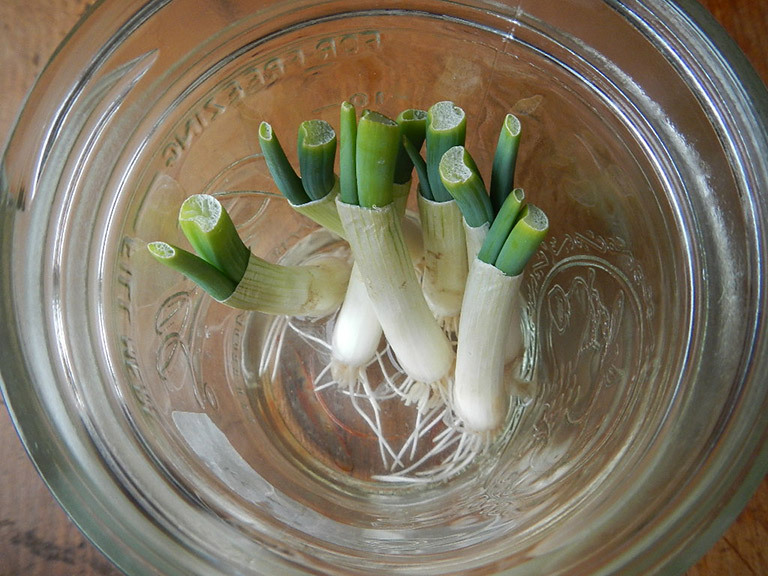 If you happen to find a clove of garlic that has sprouted, try placing it in a small cup of water and grow yourself some garlic sprouts. While the shoots are still young, cut them off and chop them up to add a little flavor to casseroles or baked potatoes. 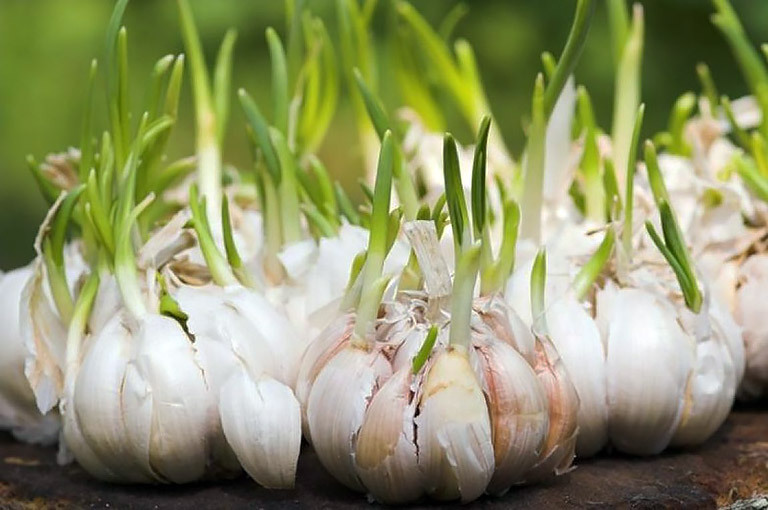 You can also use sprouted garlic to grow a new head of garlic by planting it sprout-side up in the garden. This is best done in the fall so the plant has plenty of time to produce a big bulb before harvest. 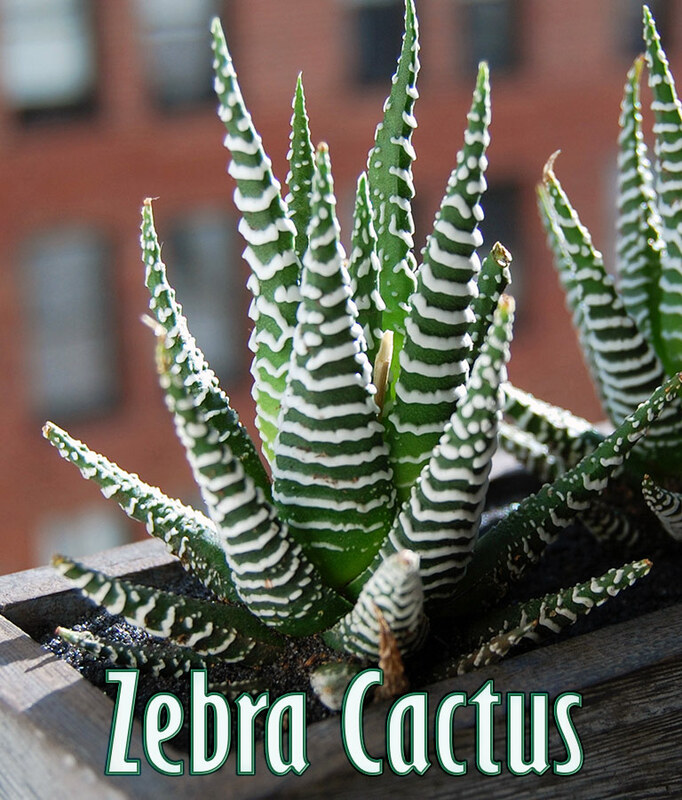 Simply chop off the white bottoms and place them in a small glass with fresh water. After a few days, you’ll see new green growth on top. Be sure to change the water daily! 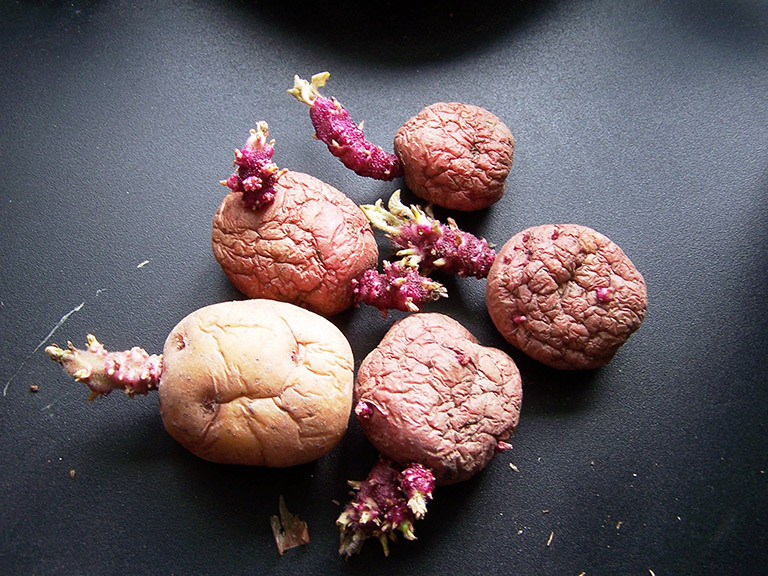 Have you ever reached into your potato bag to find a few squishy potatoes with sprouts coming out of them? Before tossing that tuber in the trash, think about planting it in your garden for a whole new crop. You can grow a lot of new potatoes from just one sprout, just make sure to plant it in fertile soil in full sun, and hill up more soil around the sprout as it grows. 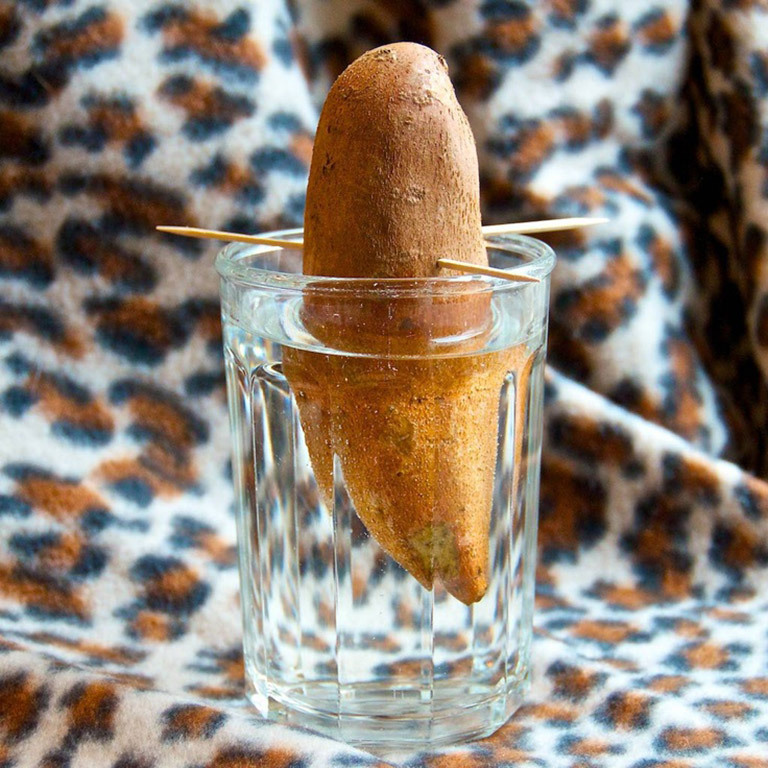 Stick some toothpicks in a sweet potato piece and place it in a cup of water. Sweet potato vines will begin growing from the tuber after about a week. You can either eat the leaves or cut the stems off the tuber and plant them in the ground for a new crop of sweet potatoes. Even if you decide not to replant the sweet potato outside or eat the slips, you can enjoy this beautiful vine as a houseplant, just give it a sunny window and something to climb! 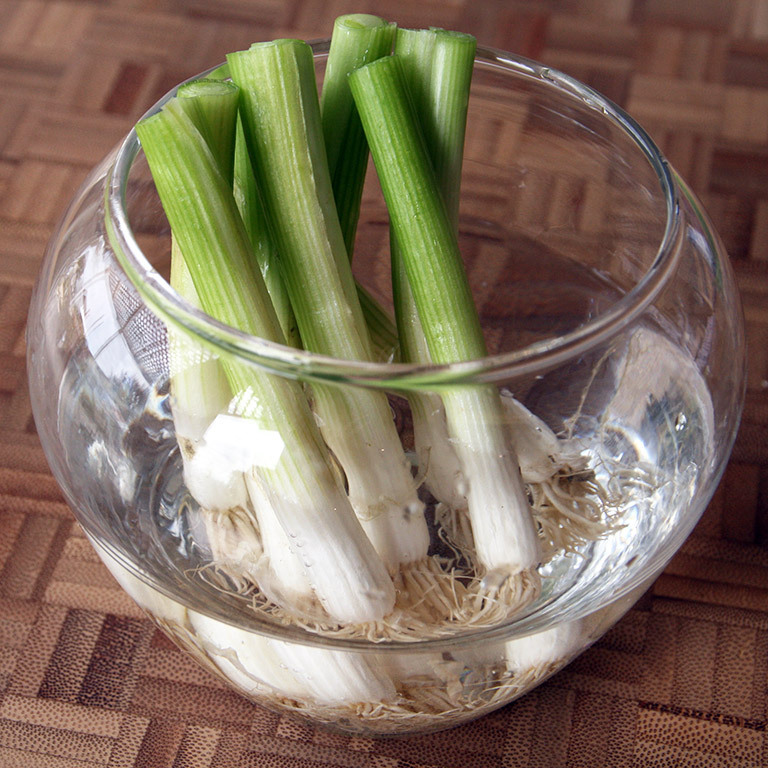 The white roots of a celery stalk can be placed in a shallow dish of water to re-grow the stalks. Be sure to keep the water line just around the roots so the stalks don’t rot. 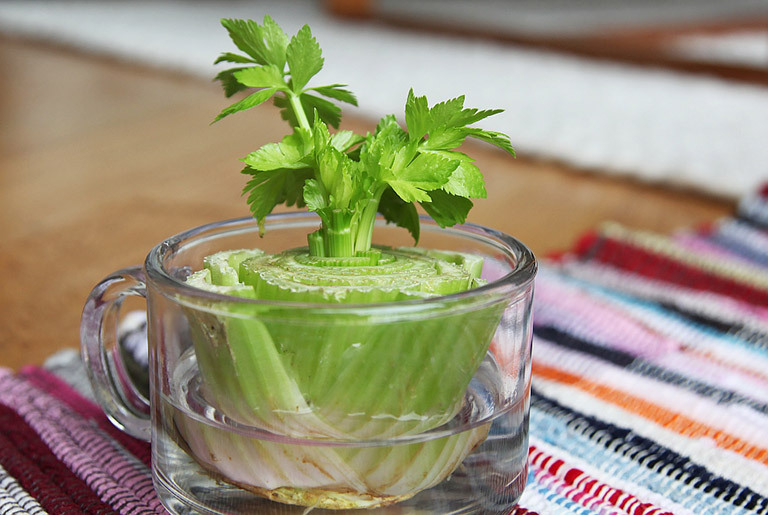 Once it’s rooted, the celery can be planted in soil to grow a second crop. Here’s another tricky one that takes a whole lot of time. 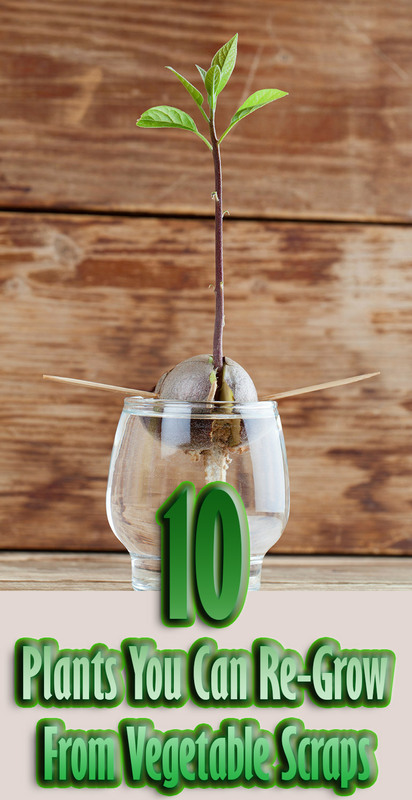 Avocado trees can be successfully re-grown from the pit of a grocery store avocado. The downside is, most of these trees won’t produce fruit unless they’re grafted with a fruiting avocado tree. Even so, it’s a fun project and very rewarding to see how huge these trees can get! 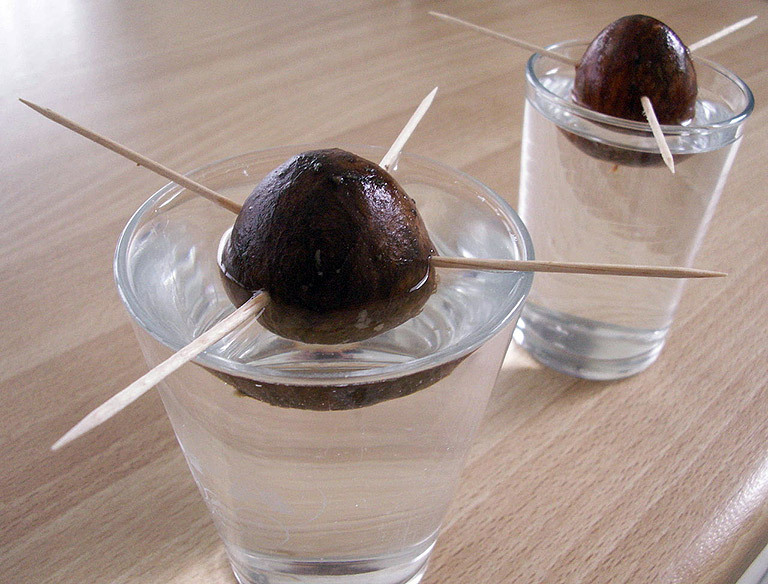 To grow your own avocado tree, stick a few toothpicks into the pit and place it pointy-side up in a cup of water. Change the water frequently and after a few weeks, roots and a shoot will appear. Be patient, this part takes a lot of time. When the roots appear, you can place the pit in potting soil. The tree will need to be kept in a sunny place, and brought indoors in the winter if it’s cold.